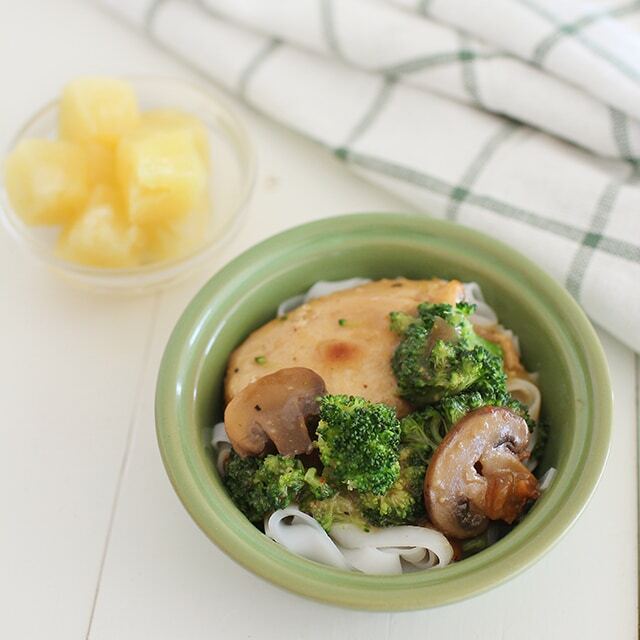 Delicious Crockpot Chicken and Broccoli Meal! Perfect for picky eaters. Q: My kids won’t eat anything orange. Actually, they won’t eat any fruits and vegetables for that matter. What can I do? The biggest most effective way to get your kids to eat more fruits and vegetables is to be a role model. This is a great quote, “One study, using sliced bell peppers, found that bribing, cajoling, exhorting, and even rewarding kids for trying new vegetables are less effective than simply eating them yourself. Just sit down and eat yourself, and talk about how good it tastes. It will have a much bigger impact than if you give them a lecture.” Lorraine Stern. And it works the other way around. When I’m drinking my diet coke, I shouldn’t be surprised when they want some too. So now I have to drink it in the closet! Do kids really give vegetables a try if you arrange them into faces, or cut spiderman into them. Some might, but mine don’t. Don’t make a big deal out of your child not trying things. Just make it familiar to them at every meal. They should expect to see vegetables on their plates at every dinner. But you don’t want food to be punishment. Let them get hungry. Constant snacking, especially before a meal is a surefire way for them not to try new things. The best meals my kids have eaten have been when they come to the dinner table famished. However, all those who know me personally will call me a fraud on this one, becasue my kids graze ALL day long. And as a result, they are not good at eating dinner. Do not provide alternatives. If you think your kid will starve if you don’t give them what they want, you are wrong. Sure they may be hungry for a few days, but they will come around and start eating the new food you stock in the fridge. Lastly, if your child is growing and has sustaining energy for all the demands of his little life, than just chill out. And don’t forget to tag us if you make this meal! Place chicken in crockpot. Sprinkle with dressing mix. Slice mushrooms and dice onion; add to crockpot. Using a medium sized bowl, mix cream of chicken soup with 1/4 cup broth; whisk together. Pour into crockpot. Cook on low for 3 hours. 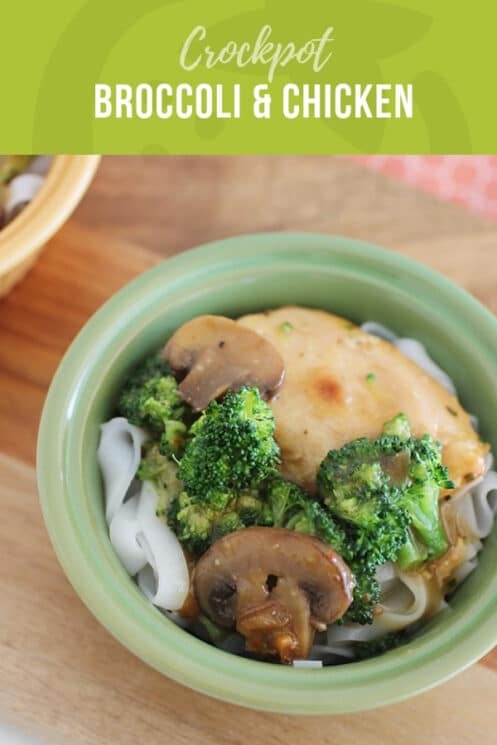 Once chicken has cooked for 3 hours, add broccoli and continue to cook on low for an additional hour. 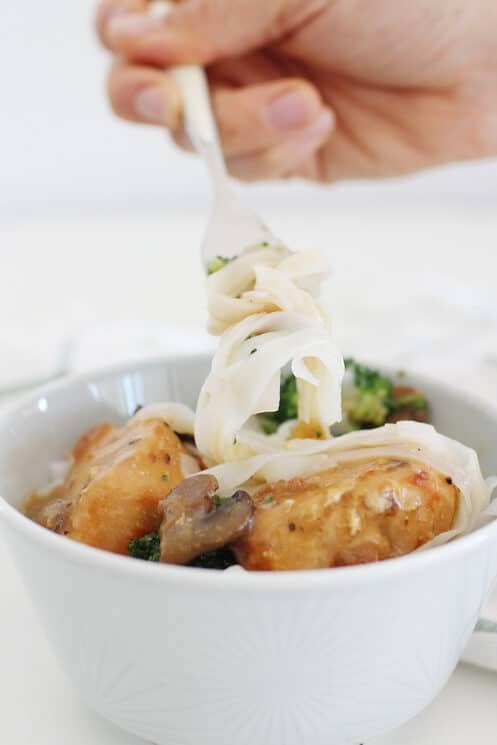 Cook rice noodles; serve with chicken. I use my crockpot almost every Sunday for the same reason! 4 hour total cooking time for raw chicken? Is this on high? Or incorrect? It was good. I didn’t have enough broccoli, so I added some cauliflower. Next time I’d do even more mushrooms too. Morgan- It’s certainly has saved us many times. Laura- Yes our chicken was definitely cooked through on low for three hours. Love this recipe! I’ve made it before and we loved it. Great recipe for Sundays for sure! We just received a slow cooker as a gift and are excitedly trying it out. And we didn’t do chicken yet. Thanks for the recipe! We do crockpots on Sunday, too, for the same reason. Especially with this darned 11-2 church! Post more easy crockpot recipes please!!! when you put the chicken and italian season in crockpot do you add water or chicken stock?? I did not add any liquids. The juices from the chicken seemed to be sufficient. This was so good last night after swim! What a great mild tasting recipe! How much is a “packet” of Italian seasoning. I’ve got a box but it seems a bit much! Hi Rebecca, is looks like one packet contains about 2 tablespoons of flavorings. Keep in mind the packets are a little different from Italian spice blends, though. You may want to pick up a packet of the dressing mix if you’re hoping for results exactly like the recipe.